I watching a wildlife programme on TV the other day which had a feature about urban foxes. The naturalists had fitted radio collars to some of the foxes and were able to track them over a wide area.One fox went off on a trek that lasted a couple of weeks and covered a distance of several kilometres. In another programme radios have been attached to larger birds such as geese and ospreys to track their migration paths. I wonder what frequency is used? One of the maturalists in the urban fox project seemed to be trying to DF a fox using what looked auspiciouslylike a 3 element 2m Yagi. I've seen similar antennas used o locate larger animals in Africa. I would love to know what technology they use. My Kenwood TH-D7E APRS radio - despite being too big to use as a tracker for anythimg much smaller than an elephant - can run for only a few hours with the GPS enbled and the power set to a sufficient level to enable tracking over a reasonable distance.using a less than optimal transmitting ntenna. WSPR never loses its ability to astound. 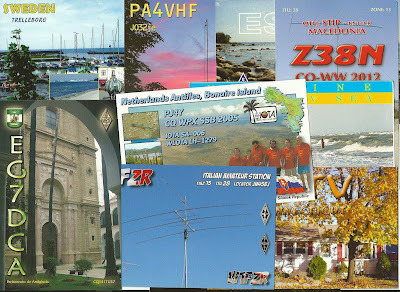 Today I've been WSPRing on 10m, still with 0.2W. My signal was decoded by 5 different Stateside stations. I've been WSPRing on 30m today, still with a power of 0.2W. 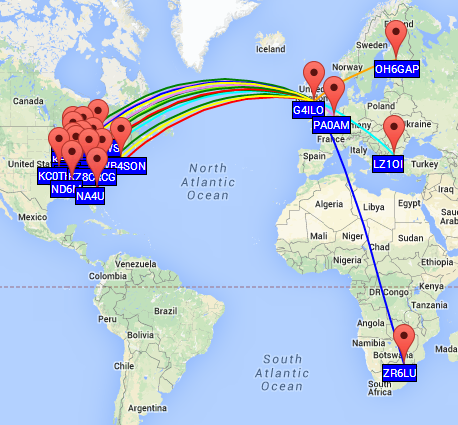 I think WSPR is more interesting when you use low power: it's always interesting to see how far you can get. 20mW is not the lowest power you can use, though, it's just the lowest power the K3 will comfortably produce. (You can set the output power to 0.0W but I'm not sure how accurately the rig will maintain the power at such a low level - something to check. Javier Solans, EA2GCY, maker of the Iler 20 and 40 kits is now selling a range of kits from YouKits. The new kits are already listed on his very impressive-looking web site. If this means that the Chinese-made kits will now have building instructions to the same high standard as Javier's own kitsit is very good news for kit-builders. 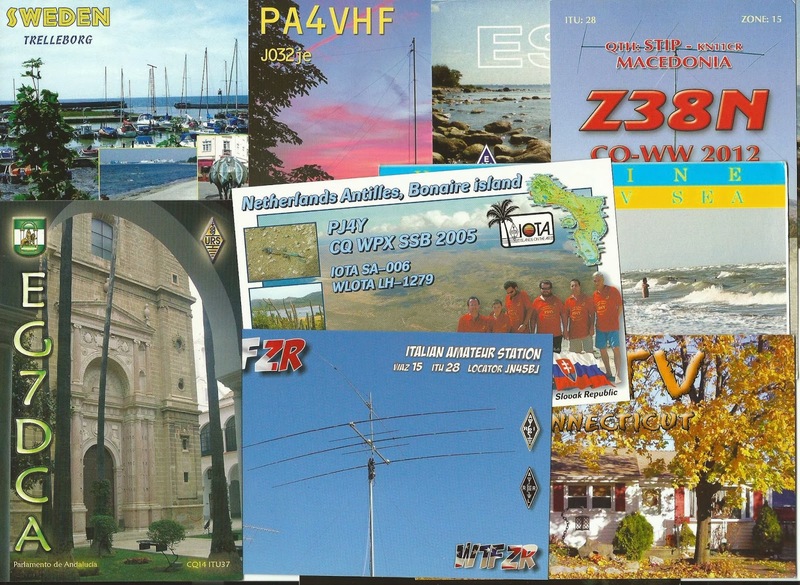 Many people who operate the weak signal mode WSPR use too much power. If you don't use very low power (QRPp) you'll never find out what this mode is capable of. So to remind myself I thought I'd do some whispering on 10m using 20mW of power. It's easy to use low power with the Elecraft K3 as the power level is adjustable in 0.01 watt increments. The original version of K1JT's WSPR software had pop-up "tip" windows that showed the power in watts when you hovered the mouse over the dBm setting. Very useful for duffers like me that can't do a watts to dBm conversion in my head. The new version WSPR-X doesn't, however. I found (or more truthfully Google did) an online watts to dBm converter on the web which I have duly bookmarked. The night before last Olga and I nearly jumped out of our skins after a tremendous thunderclap which sounded as if it was just a few feet away. I wasn't concerned for the radios as I didn't think attic antennas would suffer from a lightning strike unless the house itself was struck but in any case both antenna switches were in the grounded position after I had heard thunder a few days earlier. I checked both the K3 and the FUNcube Dongle which was the only other radio connected to an antenna and both seemed to be OK so I thought I had got off scot free. That afternoon Olga noticed that the Netgear DECT Skype phones were not displaying the amount of money in the account. Later I tried to make a Skype call and was informed that Skype was offline We could still make landline calls from the phones but only if we dialled manually. Any attempt to call a number in the Contacts list using the landline received the message "The number you have dialled has not been recognised." Poking the Netgear base unit's Reset button with a sharp stick didn't solve the problem. It looks as if the SPH200D base unit is broken. I'm rather sorry about that because it's an obsolete product and new ones are unobtainable - although eBay has a used one on offer for several times what it cost when new. Olga uses Skype a lot to talk to relatives in Ukraine so it was very useful to have Skype connected all the time and not just when she was using the computer, but it's looking as if we will have to live without that facility. That evening we turned on the Humax Freetime box to watch some TV and there was no picture. We checked the voltage from the power supply, which is a small 12V 4A "brick rather than internal switched mode supply. Zero volts. We checked the fuse and that was intact. Unfortunately the Humax power supply has an unusual type of plug so I can't use one of the collection 0f wall warts that I have in a box in the garage to test if the satellite receiver itself is working or whether it's just the power supply that has failed. There is no proof that lightning really did cause these items of equipment to fail - everything else including the broadband router are still working - but it's quite a coincidence it it isn't.. SoNow all I can do is wait until next week and order a new power supply from Humax. Oh happy days! At least we can still watch TV as I kept the old Freesat box as a backup. Postscript. According to a neighbour a house a few streets away was damaged by the lightning bolt. Doesn't seem near enough to have blown up two items of equipment though. 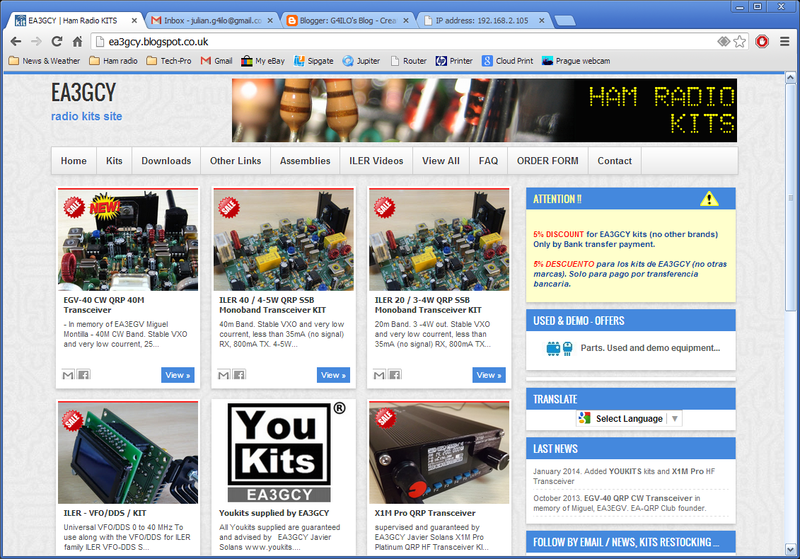 Many of you will have seen these propagation banners on many ham web sites. They are generated by a script on the G4ILO's Shack website. It appears that NOAA changed the format of the wwv.txt solar data file with effect from I January . When I turned on the computer I was greeted by a pile of "bad data" messages from the PHP script that processes wwv.txt and turns it into an intermediate data file which is used by WebProp (and also VOAProp) to display the current solar data. Unfortumately I cannot fix iy. My vision is too confused to read type very well and my brain is too befuddled to deal with technical compouter stuffany more. Even typing a blog post is a trial for me at the moment. I have hade to make dozens of corrections even to get this far (one reason for the dearth if blog postings recently. Is there anyone who knows PHP who would be willing to take a look at the script and fix it so tyhat it will work with the current bersion if the wwvntxt file? I foolishly thought that if I just left erything as it is then it would juat carry on running without any work from me. Unfortunately things get updated and require changes to be made. Maintaining this website has become burden I could do without right now It causes me a lot of stress and upset that I can't manage to do things i could easily do before. The easiest solution might be just shut down g4ilo.com for good.